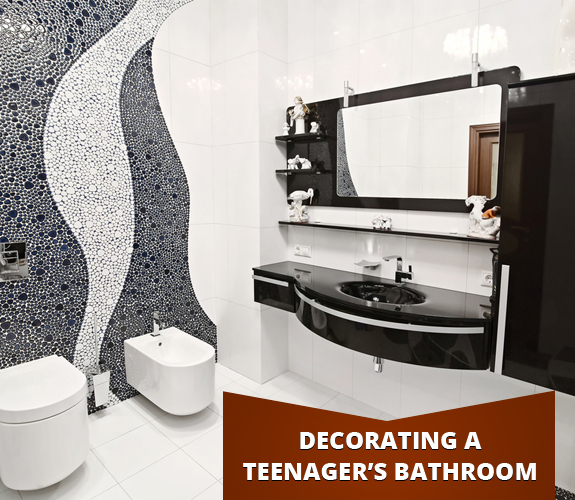 When redesigning your teenager’s bathroom, it’s a good idea to let them express themselves by having some say in how it will be decorated. Sit down together to determine the theme, color scheme, and organizational ideas to create a unique and functional space you can both be happy with. If you have more than one teenaged child and they share the bathroom, be sure to get input from both of them in order to blend their styles and meet both of their needs. Applying a fresh coat of paint to the walls can dramatically change the look of a teen’s bathroom without costing you an arm and a leg. Let them choose the color and then help them paint the walls. Electric hues like hot pink, green apple, and juicy tangerine can fill a space with energy while quiet neutrals such as pure gray, creamy ivory, and medium beige provide a subdued backdrop. A semi-gloss paint finish is best for the bathroom as it will resist humidity and stand up well to chipping, scuffing, and staining. Simple blinds in a perky color can add privacy and a punch of color to a more subdued bathroom while an artsy teenager may wish to paint a design relevant to their bathroom style on plain white blinds to create a more unique and personalized space while enhancing the theme of their bathroom. Organizing their bathroom may not be at the top of their list but it is possible – and important – to blend style and storage to create an organized space they will love and keep neat. Clear out all of the old clutter before you start including old and unwanted cosmetics, toiletries, and personal hygiene items. Store attractive items like bath beads and lotions grouped together on a decorative countertop tray and store all remaining personal items in woven baskets, lively colored bins, or even small metal buckets on a free-standing shelving unit or within built-in cabinets. For a girl’s bathroom, you may wish to add a stand-alone vanity designed with an attached mirror and deep drawers. This will accommodate all of her make-up and hair accessories while providing plenty of room for primping. Replace your boring old shower curtain with something hip and exciting that matches the bathroom’s theme. Alternatively, you may wish to replace the curtain entirely with a shower door. Select bath towels, washcloths, and hand towels in colors matching their décor. Delight your teenage daughter by replacing an ordinary ceiling fixture with a sparkling chandelier or replace boring wall sconces with shiny silver. Lighting is one of the best ways to freshen up an old bathroom. Add a cool night light for night time visits and find coordinating accessories such as a water glass, toothbrush holder, bathmat, and soap dispenser.